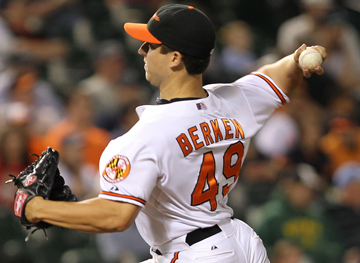 Jason Berken is a retired MLB pitcher with 11 years of professional playing experience. Erik Cordier is a retired MLB pitcher with 14 years of professional playing experience. Paul comes to ISA from Base Knox Sports Academy, a training facility he has owned for the past 7 years. Jean Rivett recently retired as the Assistant Softball Coach at St. Norbert College, De Pere, Wisconsin. Jason grew up in De Pere, WI and was a standout three sport high school athlete in baseball, basketball, and football. Throughout his high school career he was a four time varsity letterman in baseball and three time letterman in football and basketball. He accumulated several honors and awards – most notably he was twice voted an All-Conference, All-District, and All-Area player. In addition, as a senior, he was the Press Gazette Player of the Year and Gatorade State Player of the Year. In the spring of his senior year of high school, Jason accepted a baseball scholarship to Clemson University. At that time, Clemson was rated the #1 collegiate team in Division 1 baseball. In his four years at Clemson, Jason compiled an 18-6 record with a 3.03 ERA. He was voted Team Captain twice and was an All-ACC Performer his junior year. In 2006, Jason was drafted by the Baltimore Orioles in the 6th round (175th overal l) of the MLB draft. 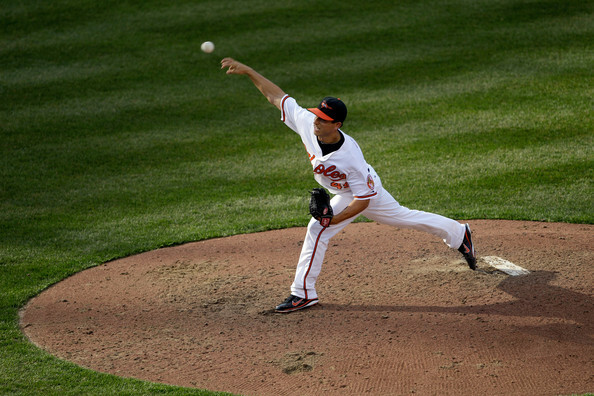 After just over two years in the Orioles minor league system, Jason made his MLB debut on May 26, 2009 against the Toronto Blue Jays. He earned his first Major League victory that night as he pitched five innings, giving up two runs. In his rookie season, he compiled 119 innings over 24 starts – the 5th most starts by a rookie in the Orioles franchise history. Over the next four seasons, Jason accumulated a 10-20 record, with a 5.36 ERA in 110 appearances with the Orioles and Cubs. Jason has been a member of the Orioles, Cubs, White Sox, Giants, Phillies, and Blue Jays organizations. Erik grew up in Door County, WI, and was a graduate of Southern Door High School. As a three-sport athlete, he received multiple All-Conference awards for football, basketball, and baseball, including 3rd Team All-American Pitcher, Gatorade State Player of the Year, and Louisville Slugger State Player of the Year. As a senior, Erik committed to NC State on a full baseball scholarship but decided to forgo college after being drafted in the second round of the 2004 amateur draft, 63rd pick overall, by the Kansas City Royals. In 2014, Erik made his MLB debut with the San Francisco Giants, where in just one inning, he threw 16 pitches of at least 100 miles per hour. That same year, Erik would travel with the Giants as an alternate during the playoff run, including a trip to the World Series. Erik received a World Series Championship ring after the Giants won the series, beating the Kansas City Royals. Erik has been a member of the Royals, Braves, Pirates, Giants, Marlins, and Red Sox organizations, and spent a season playing internationally with the Orix Buffaloes of Japan. 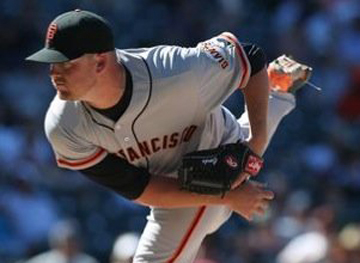 He has close to one year of MLB service time between the Giants and Marlins organizations. Paul Wagner comes to ISA from Base Knox Sports Academy, a training facility he has owned and operated for the past 7 years. Over the years, Paul has worked with hundreds of NE WI baseball and softball players developing their game both on and off the field. While running Base Knox Sports Academy, Paul and his staff have had several individuals reach their season pinnacle by receiving All-Conference and Player of the Year awards, some of whom have also gone on and enjoyed successful college careers as well. Paul enjoys working with teams on development, and his teams have gone on to have successful summer league and tournament play. Coach Wagz will continue to dedicate his time and effort through ISA and the greater Green Bay area to make sure each experience is a special one so kids continue to enjoy the game they love to play. Jenna Woepse was previously the Varsity Head Coach at Bay Port High School, amassing a 70-23 record over 4 years where she was named Coach of the Year twice in the FRCC (2015 & 2017). 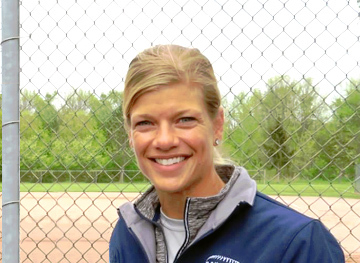 In years prior to being named Bay Port’s head coach, she held positions as Assistant Coach on the Varsity squad and was the JV coach at both Bay Port and Green Bay Preble. In 2015, Jenna led the Pirates to their first trip and win in school history at the State Tournament. The Pirates also had two conference championships under Jenna. Jenna’s playing career consists of playing shortstop for a top premier team in Auckland, New Zealand in 2009 where she amassed a batting average of .400 and a league-leading 21 stolen bases. Jenna completed a 4-year college career at the Division I, University of Wisconsin-Green Bay. She received First Team All-Conference honors her sophomore year, was named Team Captain her senior year and was on the academic honor roll. Jenna currently resides in Green Bay, but her hometown is Manitowoc, WI where she was a three sport, All-Conference athlete and four year varsity softball member. Jean Rivett recently retired as the Assistant Softball Coach at St. Norbert College, De Pere, Wisconsin. Jean was in her second stint as the Assistant Coach at St. Norbert College and coached at St. Norbert from 1981-1991 and again from 2014-2018 before announcing her retirement from coaching on May 1, 2018. 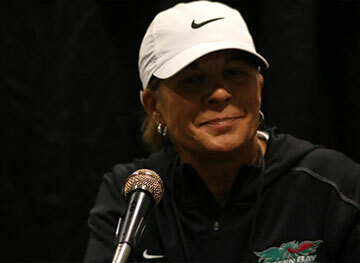 Prior to her position at St. Norbert College, Jean was the Head Softball Coach at the University Wisconsin-Green Bay the past 14 years (1992-96) and (2004-2014). Jean also spent 4 years (1996-2000) as the Assistant Coach at Lawrence University and 4 years (2000-2004) as the Head Softball Coach at Green Bay East. Some of Coach Rivett’s coaching accolades include being named the 2004 and 2014 Horizon League Coach of the Year since retiring from UW-Green Bay in May of 2014, and retired from Green Bay as the winningest softball Coach in the school’s history. Jean also held the position as the Horizon League Softball liaison/representative for the Commissioner of the Horizon League for 2 years while maintaining her coaching duties at UW-Green Bay. Jean also held the position as Women’s ASA Fastpitch Commissioner for the State of Wisconsin for 4 years before resigning in 1992 due to her responsibilities at the University Wisconsin-Green Bay. Along with her duties as Women’s Commissioner for Wisconsin, Jean also served as the Women’s Valley Classic League President for five years. Coach Rivett is a well-renowned pitcher, coach, and softball strategist who has been coaching the game of softball for over 30 years. Jean was an avid top Major A pitcher/player for 18 years and has attained many individual honors and awards during her playing days (national and local). One honor bestowed to Jean was being inducted in the 2009 Wisconsin ASA Hall of Fame as a player/coach and ASA Commissioner. In 2014 Jean open and operated P.I.T.C.H. (Private Instruction, Training, Consulting and Hitting lessons) and conducted numerous softball clinics/camps and seminars nationwide. During her free time Jean has been in the process of publishing a fastpitch softball book for youth/travel ball programs and plans to continue to travel and promote softball throughout the United States and assist with USA Preps Camps. Also, Jean is currently an active member of the NFCA (National Fastpitch Coaches Association) and continues to take the time in studying the game and inventing creative ways to teach the game. Kari Bern (Corbeille) is originally from Crivitz, WI and while in high school she played three sports, but excelled in softball. With Kari on the mound her senior year Crivitz won regionals for the first time ever in school history. She was team captain (2007), team MVP (2006 & 2007), 1st Team All-Conference (2006 & 2007) and M&O Conference Player of the Year (2007). She continued her playing career at St. Norbert College. Her sophomore and junior year they won conference and Kari made pitching appearances in both championship games. Her junior year was one for the record books. Her junior year was the most winningest year as an all around athletic team in school history. She also threw St. Norbert’s first ever NCAA Regional win the NCAA regional. 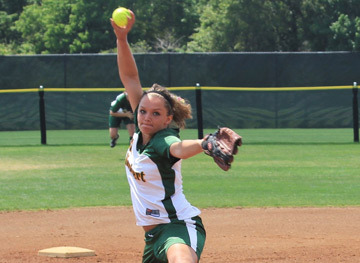 Kari was an at-large NCAA regional selection as a pitcher having an ERA that weekend of a .88. During her junior season her ERA was a 1.28. Lastly, she was ranked in the Top 25 Division III pitchers in the nation and a 1st Team All-Conference pitcher in the Midwest Conference. She was then selected to travel with a national team over in Italy the summer after her senior year. After spending 4.5 years in Minnesota, Kari moved back to WI and has done lessons and coached for 7+ years. She coached high school ball at Bay Port High School (WI) and Wayzata High School (MN). She also coached Minnesota club teams (MN Whirl, TC Racers). 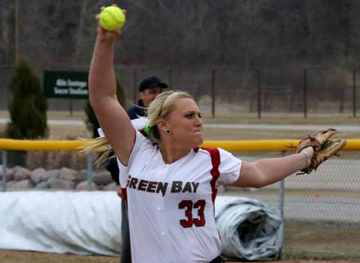 While in MN she also gave pitching lessons for TC Fastpitch Academy for 3 years. 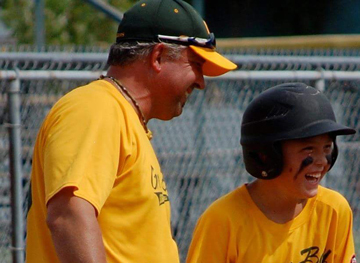 Jen Roskom joins ISA with nearly 15 years of experience coaching softball. Having had a love for playing softball since she was 5 years old, she developed a keen sense of the strategy and nuances of the game. Jen graduated from Bay Port High School (Green Bay), then applied her softball knowledge and leadership skills coaching youth softball in the summers during college. 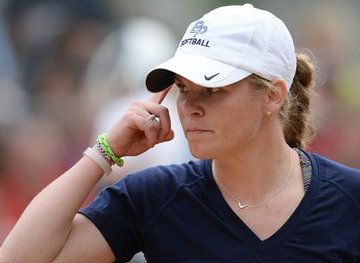 After graduating from college, she started her career coaching at the high school level, accepting a position as the Freshman softball coach at Bay Port High School (2005). Jen spent a season coaching at the Varsity level (De Pere High School 2009) which reaffirmed her drive and aptitude for developing young players and helping them achieve a higher level of performance. She accepted Junior Varsity level positions (De Pere 2010 and Bay Port 2006-08, 2014-2017) where developing fundamentals, focusing on gaining that competitive edge, and developing the right winning mindset are keys to furthering a successful softball career. Ashley Nannemann is originally from Waterford, WI and while in high school she was a varsity letter winner in three sports, but excelled in softball. Her senior year she had pitched two perfect games and four no hitters. She was recognized for All-Conference, All-County, All-Area awards as well as being nominated for the Wisconsin All Star team. Ashley continued her playing career at the Division I, University of Wisconsin-Green Bay. At Green Bay she led her team to win both the Horizon League regular season title, for the first time in school history, as well as the Horizon League tournament title in 2014. 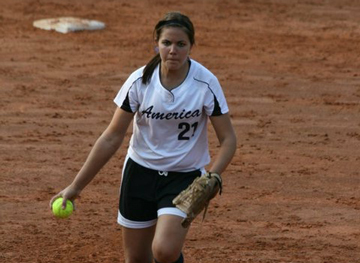 Her senior year she was ranked the no.1 pitcher for Division 1 softball Nation-wide, for nearly half the season. She was named to the Horizon League All-Tournament squad while being named the tourney MVP and top pitcher. In 2015 she played professionally for Nuoro – a feeder program for the Italian National Softball League. 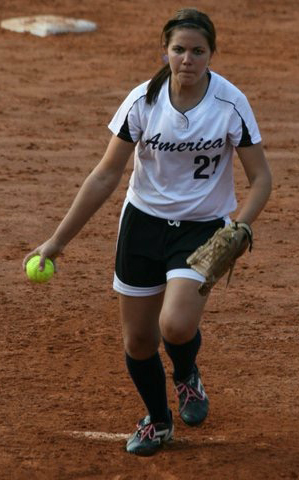 While overseas she had the opportunity to pitch as well as play shortstop. After one season with the Nuoro softball team she had returned home to pursue a career as a graphic designer. Currently Ashley resides in Appleton and continues to run pitching clinics and lessons. Jessica Kropp is a former Red Raider from Pulaski, WI. With her defense behind her, she earned great success in 2007 & 2008 as starting pitcher. Both years, Pulaski stood atop the Bay (2007) and FRCC (2008) conference. In 2007, the Raiders fell just one game shy of the state tournament in 2007 after a 2-1 loss to Appleton North. She was named 1st Team All-Conference (2008), 2nd Team All-District (2008), Captain (2008), and 2nd Team All-Conference (2007). She followed her softball career into college, playing with the Green Knights of St. Norbert College. Graduating in 3.5 years, Kropp pitched for the Green Knights through three Midwest Conference tournaments. Her role on the St. Norbert team varied, she found success as a designated hitter and in the infield when she was not pitching. The experience has taught her a great deal about the mental capacity and tenacity needed to be successful in the game. Over the last seven years she has returned to her home field, in Pulaski, to coach and mentor pitchers (of varied levels of experience and age) and teams for their summer seasons. Tanner was born and raised in Wrightstown, WI and now currently lives in West De Pere. Tanner attended the University of Wisconsin – Oshkosh to study Kinesiology (Exercise Science) and play college baseball. Several injuries caused Tanner to step away from playing and focus on school and coaching. Tanner spent 3 seasons coaching the 15u Wrightstown Babe Ruth Baseball Program before graduating college in 2014. During the last four years, Tanner has worked for D1 Sports Training, Bellin Sports Medicine, and West De Pere High School training athletes and adults of all ability levels. A major focus of his is working with baseball players to become more powerful, faster, and mobile in order to increase performance on the field and decrease risk of injury. Tanner has worked year round with the West De Pere Baseball Program the last 3 years focusing on power, speed, and injury prevention off the field. Tanner currently holds 4 nationally recognized certifications. He is a Certified Strength and Conditioning Specialist (CSCS), Corrective Exercise Specialist (CES), Certified USA Weightlifting Coach (USAW1), and Fitness Nutrition Specialist (FNS). Douglas Coe is an Appleton North graduate and attended UW-Stevens Point majoring in Elementary Education. 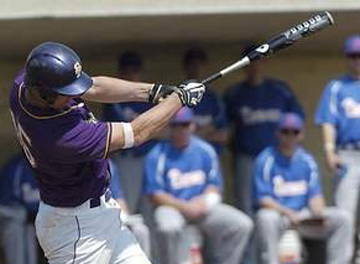 He played in the NCAA Division III Baseball Championships in 2006 and 2007, finishing 3rd in 2007. He was named First-Team All-American and Regional Player of the Year in 2008. He was inducted into the University of Wisconsin- Stevens Point Athletic Hall of Fame in 2018. Coe played three years professionally for the Windy City Thunderbolts and played on the 2008 Frontier League Championship team. Douglas is currently an Assistant Coach at UWSP. Douglas was the varsity head coach at Wisconsin Heights in 2011 and Notre Dame Academy in 2015-2016 while leading them to a Runner-Up finish in the WIAA State Tournament. He was an assistant coach at Lawrence University for 5 seasons and one season at Appleton East High School. Douglas graduated from Ohio University with a Master of Athletic Administration in 2017. Hunter grew up in Marquette MI and graduated from Marquette Senior High School in 2014. He was a two sport athlete throughout high school playing baseball and hockey. Although he didn’t play baseball for his highschool, he played American Legion for the Marquette Blues where he won a State Title his final season. After high school he attended Saint Norbert College in De pere Wisconsin where he played baseball. He was a three year starter and a career .334 hitter. In his four years at Saint Norbert, he was a two time All Conference player for the Midwest Conference. He was voted Team Captain his senior season. His senior year, he was the Player of the Year for the Midwest Conference as well as nominated to the All-Region team for the Central Region. He was a middle infielder, playing second his Sophomore year and shortstop his Junior and Senior Year. 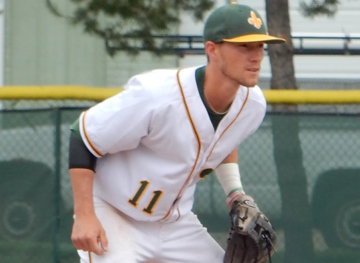 Hunter graduated from Saint Norbert in May of 2018 and will be the Head Coach for the Freshman De pere baseball team this coming season.